Rebuilding 17 Avenue SW, between Macleod Trail and 14 Street S.W. Home News-Feed Rebuilding 17 Avenue SW, between Macleod Trail and 14 Street S.W. After 30 years, we’re rebuilding 17 Avenue SW so the road can continue to serve businesses and citizens for decades to come. Improvements will occur on 17 Avenue SW, between Macleod Trail and 14 Street SW. The work includes rebuilding the street, redesigned sidewalks and intersection areas, a new road design and upgrades to underground utilities. The project aligns with our vision of Calgary as a city of inspiring neighbourhoods and one that moves. It is an investment in the long-term success of 17 Avenue SW- one of Calgary’s most popular destinations to shop, visit and do business. Continue upgrading the shallow utilities (power and telecommunications), between Macleod Trail and 8 Street SW, through 2016 and into early 2017. Shallow utility work is contained in small areas and is not expected to have major impacts to traffic flow and access to the 17 Avenue SW area. Hire a contractor in late summer 2016 for the major road construction in 2017 and 2018: deep utilities (water and sanitary), sidewalk improvements, and rebuilding the road. The contractor has seven months to prepare for this work, which begins in spring 2017. By providing seven months to plan for this construction, instead of the typical weeks, The City and contractor have more time to consider business needs and impacts of construction to this busy, highly popular and high density area. The result will be a construction plan that accommodates the 17 Avenue SW area businesses and allows people to access and continue visiting the area. Implement marketing plan in August 2016 through to 2018. As a way to support businesses through this three-year construction project, The City has worked with local BRZs and communities to create a marketing plan. The marketing program brings attention to the project and helps people, who visit the area, navigate the construction zone and find their way to their destination. Implement a public update, including information sessions, in late 2016, once the 2017 and 2018 construction plan is available. After 30 years, we’re rebuilding 17 Avenue SW. the street. It’s an investment into one of Calgary’s most popular destinations to shop, visit and do business so it can continue to serve businesses, citizens, communities and future development for decades to come. We’re keeping access open to 17 Avenue SW and the area, during construction. You will always be able to get to your 17 Avenue SW area destination. There’s an open line of communication between our project team and the people working, living and travelling through the area- reach the project team directly at cityofcalgary17@calgary.ca. The project team will continue talking with the area businesses and communities as we prepare the construction plans with the contractor. Since spring 2015, we’ve been working with local BRZs, businesses and property owners to ensure the construction plans allow access so customers and visitors can continue visiting the area during construction. Improved sidewalks, intersections and crosswalks will create a better space for the thousands of people who walk in the area each day. The new road design makes 17 Avenue SW safer for people travelling through the area, including those who walk, cycle and drive. An In Service Road Safety Review was carried out as part of the design because of the high number of people who travel through the area. The Review’s recommendations are included in the street design. Upgrading all the underground utilities while the street is being rebuilt means avoiding additional disruptions for major utility work in the future. The City’s Transportation Infrastructure business unit is managing the design and construction of the project. Stantec Consulting Ltd. is the prime consultant. A tender was released in July 2016 to retain a Contractor. Why are we rebuilding 17 Avenue S, between Macleod Trail and 14 Street S.W.? The 17 Avenue S.W. roadway is more than 30 years old and has reached the end of its lifecycle. To make sure it lasts for decades to come and continues to serve businesses and communities, The City needs to reconstruct the roadway, including its foundation and surface. It’s part of The City’s Major Roads Reconstruction Program, which includes reconstructing both the street’s foundation and surface. 2. What’s included in the work? Underground utility upgrades: While the road is under construction, The City is upgrading shallow (power, gas, telecommunications) and deep underground (water, sanitary) utilities that support the area’s future growth. These utility upgrades avoid additional disruptions from major utility work in the future. Roadway reconstruction: new roadway, including its foundation and asphalt surface, so 17 Avenue S. can serve businesses, communities and Calgarians for another 30 years. 3. Are you widening 17 Avenue SW? No. We are designing the travel lanes to all be the same lane width, which will result in four uniform lanes from one end to the other. These four lanes will provide more predictability and consistency for people travelling through the area, than compared to today’s design. There is a small amount of residual road space that’s being given back to the sidewalk. 4. Will on-street parking be permanently removed as part of the new road design? No. All on-street parking that is in place today will remain in place once construction is completed. 5. How has the corporation contributed to this project’s success? 6. 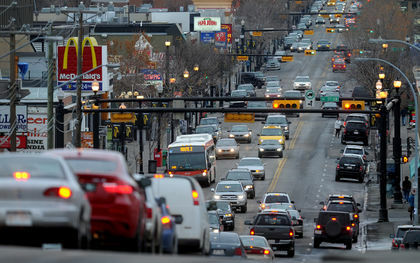 How long will it take to rebuild 17 Avenue S., between Macleod Trail and 14 Street S.W.? 7. What kind of construction impacts should citizens expect in the area?The City will work with the utility companies, construction contractor, businesses, and local communities to make sure people can still access the area and travel to their destination. Businesses access will be provided at all times to make sure people can continue supporting the local retail and commercial area. Construction will be staged, so only a small number of blocks will be under construction at any given time. The full length of the Avenue will not be under construction all at once. Within those blocks under construction, on-street parking will be temporarily removed. Depending on the type of work and block, some or all traffic lanes may have to close. 8. How is the final 17 Avenue S. road and sidewalk design incorporating the Main Street’s project recommendations? The project team is working closely with the department of Urban Strategy so elements of the Main Streets program are included in the design. The final design of 17 Avenue SW will not prevent further improvements to be made based on recommendations from the Main Streets program. 9. Where can people learn more about this project? 10. What is the budget for this project? $44 million for the design and construction of this project, including deep utility upgrades, shallow utility upgrades (such as ATCO gas, Telus and Enmax), full depth road reconstruction and sidewalk improvements.